Finding the perfect wave, slotting into the barrel, avoiding a major wipeout—these might seem like the biggest tests a competitive surfer can face. 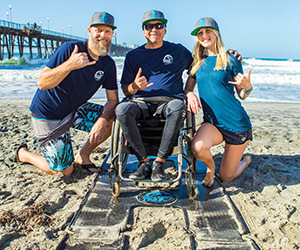 But if you’re an adaptive surfer with a spinal cord injury, making it from the parking lot to the water’s edge can present a challenge that’s not just gnarly—it’s also frustrating, exhausting, and disheartening. And that’s all before the competition even begins. 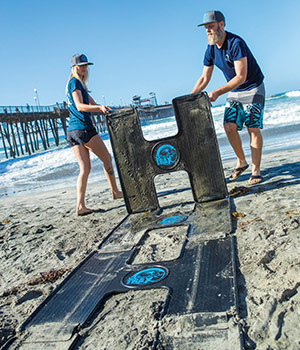 Enter Beach TraxTM, an invention from Kelly Twichel and Eric Packard, who graduated in August from the Master of Occupational Therapy program. As a project for Maureen “Mo” Johnson’s Assistive Technologies class on the San Marcos campus, they invented a collapsible track that can be laid underneath a wheelchair to allow it to cross sand smoothly. 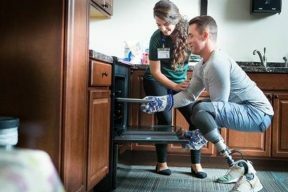 The portable pathway is on track to be patented and available for retail sale by the end of 2018. WANT TO TURN YOUR PROJECT INTO A PRODUCT? Protect your ideas. Once you’ve landed on a strong concept, protect it by applying for a patent. Look for help. Don’t be afraid to seek out help from professors outside your program. For guidance on their business plan, the inventors of Beach Trax relied on a business professor. Be willing to pony up. 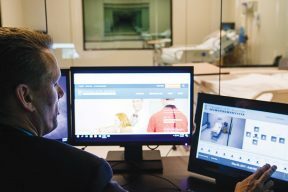 You may have to pay out of pocket for prototype design and other expenses, but in the end the investment will likely be worth it. Get feedback. The more you test your product with your target market, the more you’ll learn about its strengths and weaknesses. And don’t fear constructive criticism—it’s crucial.